Last week I pulled into the grocery store parking lot and saw a sign I had never seen before. I was kind of surprised but very pleased when I saw it. My kids were horribly embarrassed when I got out and took a picture of it on my phone. 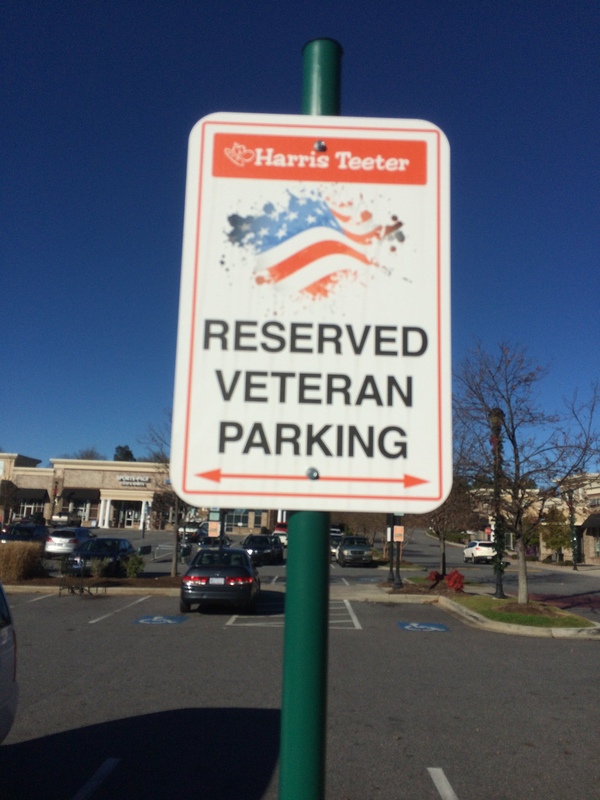 The sign has a flag at the top and the words “Reserved Veteran Parking” in all caps. I will gladly give up the first slot for the men and women who have serve(d) our country – young or old. We need MORE of this. Admittedly, I was kind of growling my answers by then so with very firm taps I tapped my phone number into the keypad. Then I remembered that my oldest told me to always hit zero each time the voice speaks and I will get a customer service representative sooner. I tried that until they hung up on me. I started again. This time I did not speak to the voice. I went directly to tapping in the numbers on the keypad. Not once did the computer get my digital phone number or account number. “I’m sorry I can’t find that information but we can try something else” got quite annoying after a bit. I did end up saying some things I shouldn’t have that are recorded for their monitoring purposes. Finally, finally I got through and the first thing the dang woman asked me was my phone number and account number. I had to count to ten to keep from blurting, “Well duh! Why don’t you have it? I entered it into your system at least a thousand times in the past thirty minutes.” I gave it to her and she informed me that the refund was indeed in progress but that it was going to take another six to eight weeks to be processed. And you know what? I am not surprised because it took them all morning to work out my phone number and account number even though it was on the letter that THEY sent to me. We need LESS automated voices and MORE humans answering the phones. LESS scripts and MORE actual knowledge about the product. One condition though. I would like them to speak in English. Tuesday evening of this week I attended Chess Club with my nine year old. The room was filled with young children sitting at tables playing chess. They were not screaming or throwing fits or working their phones. They were playing chess. NO one got upset when they did not win. They simply went to the next player. If there wasn’t a player available, then the parents filled in and played. My child and the mouthy smart-alec sitting next to him were in total shock when I beat them both. It only took an hour and he was smiling when we got back in the car. We need MORE situations with our kids where there are no phones and no distractions. We all have many situations every day in which we get aggravated and think we need LESS of that and hopefully we all can say there are things we need MORE of as well. I have a few things I would like MORE or LESS of. We need to be MORE concerned about people than the bottom line. We need MORE grace and LESS finger pointing. LESS celebrity and sports news. LESS email advertising. Seriously I get about nine million mails a day trying to sell me something. We need fewer (LESS) things that are 24/7 and MORE time to rest and restore our spirits and energy. LESS automated phone messages. The automatic calls from the schools drive me crazy! The pharmacy reminders are OK one or two times but every 24 hours gets on my nerves. And while we are on it. LESS automated, or computer generated, birthday cards. And I know it is only a computer thing. A real person is not really wishing me a happy birthday. I would like to see LESS phones sold and MORE books sold. Most of all, I would like to see MORE thankfulness for what we do have and LESS griping for what we don’t. So many of us have so much and we often fail to see exactly what we have been blessed with because we are trampling others to get more stuff. Which, by the way, we need LESS of. This entry was posted in Posts, Stories / Articles and tagged America, Automated calling, Chess clubs, Family, More stuff, Thankfulness. Bookmark the permalink.